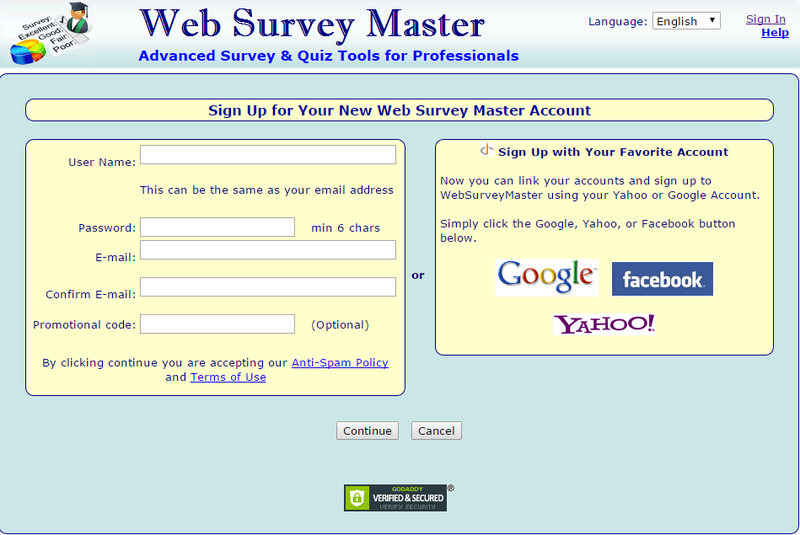 Signing-up for WebSurveyMaster is very easy. You can create a brand new account or you can just use one of your existing accounts (Google, Facebook or Yahoo) to sign-up. We will take one step at a time and will begin writing our first survey. Import from a survey definition file. For now, we will just create a survey from scratch. While the survey editor design does not look too modern (nor the whole site if I must say), it does seem to have all the tools that we need, working similar with what other survey providers like SurveyMonkey or eSurveysPro have. If you do not like the default look of the survey, you can choose another theme from the 14 predefined or you can create your own custom theme where you can define fonts and colours for all page elements. 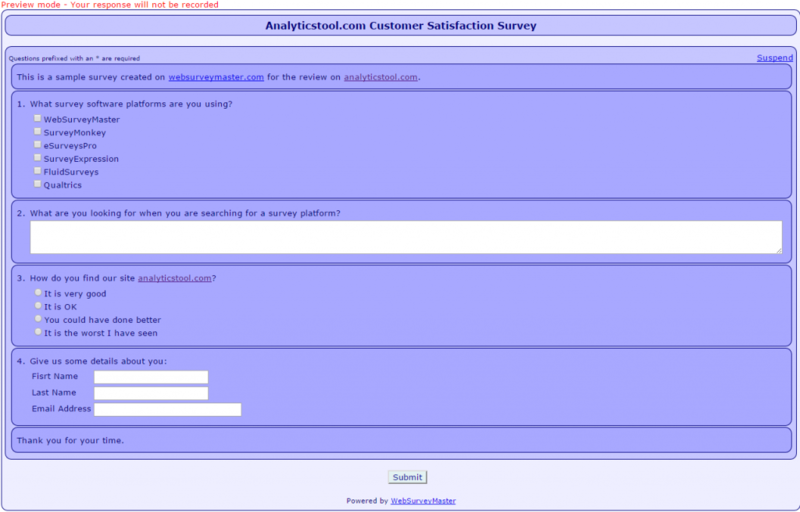 Create a survey web link to use within your own Email, Web page, blog, Facebook, MailChimp, etc. Embed your Survey directly within your own Web page, or blog. Automatically close this Survey at a future date. Protect the survey with a Password – For added security select a password that must be used to participate in the survey. Hide link that allows a participant to suspend a survey. We will add a few responses now so that we can test the reporting features of WebSurveyMaster. View all comments for an individual question with the ability to search on specific words. Export results to both PowerPoint for graphical presentations and to Excel for raw data. Source tracking allows you to determine how people are getting to your survey e.g. links on your web site, email invitations, Facebook etc. Cross tabulation e.g. break down results by gender, age range etc. We cannot finish this review without mentioning that at the Premium level, there are team collaboration options to share all aspects of survey editing, publication and results analysis. 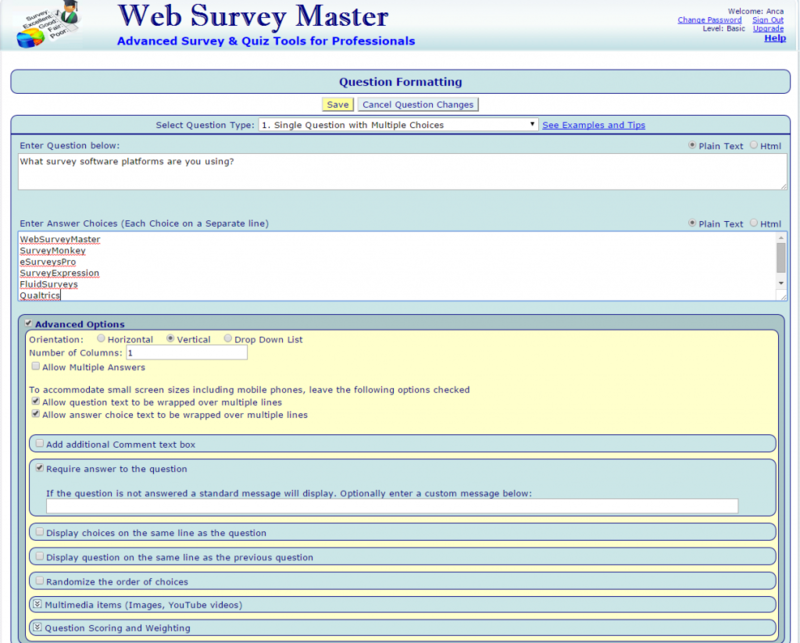 Overall, we think that WebSurveyMaster is a very nice survey software tool. The only downside we could find is the rather old looking site design, but that is not very important compared to the multitude of features that WebSurveyMaster offers. So, from our point of view, go ahead and give WebSurveyMaster a try. 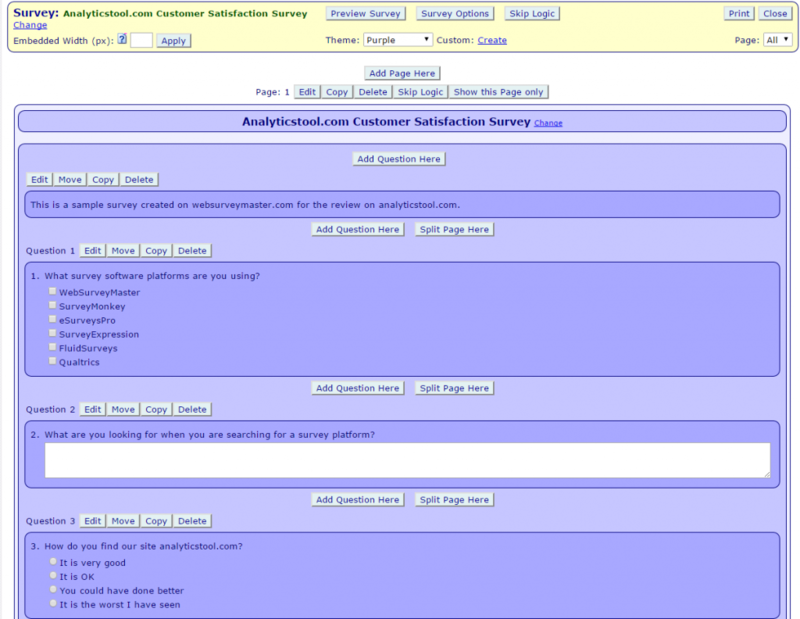 For more details about free survey sites and online survey tools, visit www.analyticstool.com.